The above man known for his no-nonsense leadership style has achieved remarkable organizational feats: establishing and creating new milestones (he has planned and executed the Metro concept in India, Konkan Railway ...). 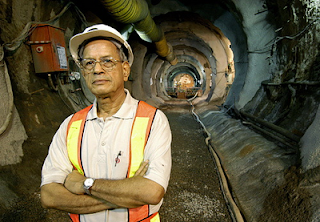 E Sreedharan is the personification of organizational effectiveness concept and leadership. Picture 1 seen above shows a ship in distress - the rough seas are tossing the ship and giving the sailors a tough time. 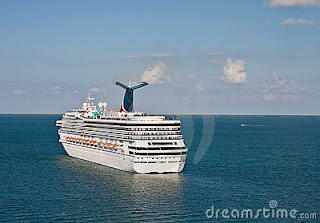 In below Picture 2, we see a ship in placid waters, the crew are having a routine and a relatively comfortable time compared to above picture. The entire premise of work life (and for that matter, family life) depends on two words: EFFECTIVENESS AND EFFICIENCY. We need to be effective with the mandate given to us by the management, and we need to be efficient too. On these two words depends the entire output of our work life. This is also true with reference to the organization. At the organizational level too, the watch words are effectiveness and efficiency. The outputs created by the organization should be in line with investor, management, customer and other stakeholder expectations. What does organizational effectiveness depend on? An organization is a group of people with common objectives. The organization is characterized by systems and sub-systems. Thus, an organization's effectiveness depends on individual effectiveness and system/sub-system efficacy. Effectiveness is the degree to which problems are solved or objectives achieved. Thus, organizational effectiveness is high if the degree to which it achieves objectives is high. If an organization through thorough analysis of its financial muscle, marketing prowess, production and manufacturing capability etc, assigns a certain sales figure as its objective, then the degree to which it achieves this target is a measure of organizational effectiveness. The mission, objectives, or goals of an organization are not necessarily in terms of sales outcomes - there are profit objectives, brand equity goals, employee stability goals, geographical expansion targets, manpower expansion objectives, customer service and market coverage objectives, and other key result areas. Once the objectives are established the effectiveness of an organization refers to how much (and to what extent) of the objectives it has achieved (or the percentage of achievement). Managers, other employees and organizational strategies are deployed so that the firm or organization can achieve high effectiveness. If a product is not of predetermined quality, then the quality systems and personnel are not effective, if the marketing goals are not met, then the marketing personnel are not of expected effectiveness ... Thus, the management and HR challenge is to create conditions that produce effectiveness in line with top management and organizational expectations. The toughest thing for firms is to establish objectives and a work environment that creates effective performance in the entire spread of the organization. The final bottomline in organizational management is effectiveness. honestly it is only about the outcome or the output - that is what life is about. When a girl's father hands over his daughter to a suitable groom, what will he see? Obviously, the father will see into the boy's personality, habits, talking style, behaviour, work profile, educational qualifications, cash flow (salary and other commitments), problem solving attititude (ability to provide solutions), energy level (no father-in-law wants a lazy son-in-law! ), assets, family culture, personal achievements and whether the boy will be able to afford a comfortable life for his daughter and future family. In essence, the girl's father will be impressed by the boy's future effectiveness as a householder - he will see if the boy has all the ingredients to become an effective householder. He can ill afford to have a son-in-law who will give excuses or shy away from taking responsibilities or always comes up with alibis or problems (and not practical solutions). Thus, the name of the game in personal, family, community, social, and work life is effectiveness. The next factor is efficiency. How fast is the employee, how accurate is the employee, and when he does work is it with minimal or negligible wastage (of time, resources etc)? However, the primacy is for individual and/or personal effectiveness. Efficient employees ought to focus on effectiveness too. What are the factors that promote individual effectiveness? 2) The training and other back up from the organization which promotes individual effectiveness. For eg., strategic directives (in which direction should the MR put his efforts), and strategic inputs (or collaterals like leave behind literatures, small gifts, CDs etc). 3) The will of the organization and management to utilize resources (human and material) to achieve the organizational objectives (at individual and system level), the organization should ideally back its people to accomplish their tasks - it involves a will to develop and use people, marshal human and material resources to be effective at the organizational level. 4) The continuous motivational programs and processes which ensures people are on their toes and morale is high (this includes compensation packages, career development, promotions, job enrichment etc). 5) Organizational culture which promotes transparency, systems, processes and other forms of professionalism. 6) Ability of the organization to have functional conflicts and not dysfunctional conflicts (which is a result of negative power games). Political management skills are vital in managerial life, however, the final goal should be organizational effectiveness - organizational politics that cause dysfunctional conflicts can be a drag on organizational effectiveness. While above 6 dimensions promote organizational effectiveness, there are other high level concepts like technology base of the firm, financial strength of the organization, legacy, philosophy, and management culture which have a vital influence on work effectiveness. Finally - last but not the least - leadership makes the difference, as we see E Sreedharan is a classic example of 'value based effective leadership for organizational effectiveness'. 1) When a ship is in distress, will there be maximum effectiveness to work collectively and achieve the goal of saving the ship? 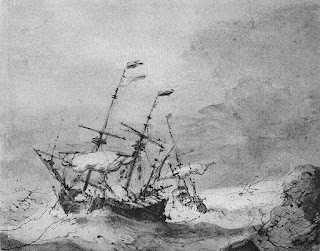 2) When the ship is in placid waters, will the sailors perform effectively or will the comfortable environment create just a wee bit of slackness? The following picture is not taken in Germany, it is our own Bangalore's Namma Metro world class metro station. We rode on Namma Metro (M G Road to Byappanahally and back on 8.4.2012) (though the electronic signboard in the photo says Byappanahally the metro station is M G Road, the sign board is showing that the platform is for Byappanahally bound metro train). 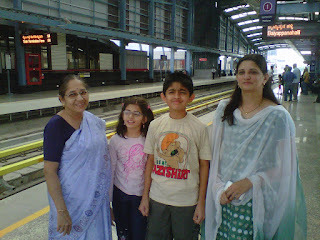 From reader's left to right: My mother - Latha S Chiplunkar, Madhuprita (daughter), Rushang (son) and Manjula (wife) at M G Road Namma Metro station (8.4.2012) waiting for the Byappanahally bound Metro to arrive! Thanks for reading this blog, please recommend this blog to your acquaintances, scroll down this blog to read other posts (click on older posts as and when required).